I am thrilled to bring you this week's edition of First Look Fridays, featuring makeup artist Rosalina DaSilva. 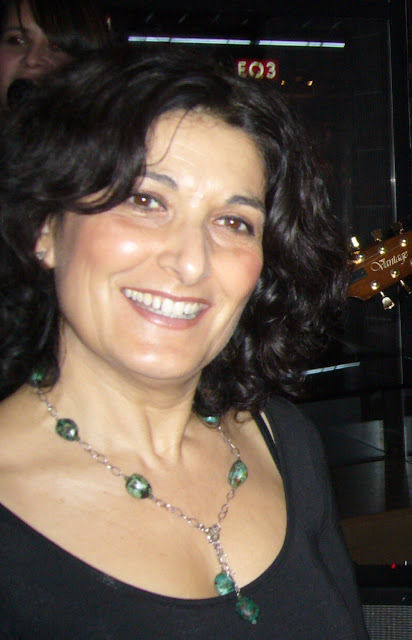 Born in Portugal, DaSilva moved to Sydney, Australia with her family in 1974. Her partnership with skincare line Kinerase is one of her newest ventures -- but over the years she's worked on movies like Josie and the Pussecats, House of Wax, X-Men: The Last Stand and Fantastic Four: Rise of the Silver Surfer. Read on to discover more about the fabulous Rosalina DaSilva! I realized my calling when at the age of 6 I did an eyebrow shaping for a friend that got me into terrible trouble with her mother, it was quite the pluck. My interest in makeup flourished, which led me to enter the 3 Arts Makeup School at the Conservatory of Music. The course was one year long. At the same time I worked and went to hairdressing school. A few years into the business, I realized that more lay beneath and the desire to learn about the skin and how to look after it led me to a beauty therapy school, where I studied for another year. I worked for a few more years in the beauty business in very prestigious salons in Australia. I've always been interested in makeup and making women look beautiful. Understanding their faces and teaching them little tricks. For inspiration I collect print work multitudes of different genres of media of various eras, as well as nature's beautiful vistas that inspire me with its shades and hues. In my early years I worked with a makeup artist called Judy Lovell. She taught me the ins and outs of the business, from how to behave on a film set to how to do a beautiful natural makeup. The Unbearable Lightness of Being was a time I'll never forget. Watchmen is definitely the most creative and fun project I've done. I'm very proud and very thankful to have been given the opportunity to design the movie. 1) I use what I feel each skin needs. I've just been introduced to Kinerase and love it. 2) Makeup: I tend to use a lot of M.A.C. 3) Also love Armani, Laura Mercier, Chanel and Shu Uemura. There's always something in each line that becomes my favorite. 4) From time to time I'll go to a department store and see what's new, get up to date with the latest from every brand of makeup. I try most products on myself first. 5) I always have to have a great concealer, like M.A.C Select Cover Up. Or a bronzer like M.A.C Honour. 7) Armani black eyeliner pencil. 8) At the moment I'm in love with the M.A.C Paint Pots and M.A.C Fluidline. They stay on all day and don't move or crease. 9) Make Up For Ever waterproof eyebrow corrector is a must. 1) Skincare: Protect your face from the sun -- use sunscreen. Take excellent care of your skin by choosing the appropriate skincare line and diet. 2) Always have well-groomed, defined eyebrows. 3) Makeup: Apply layers of mascara and curl your lashes. Use a lipgloss or moisturizer. 4) Know what are your best features and always enhance them. Definitely the creative side of the business, seeing the final product on a big screen. It's very glorifying and rewarding. Also the opportunity to meet and work with great people and have access to places that you wouldn't other wise. For example when I did a shoot in the White House and met President Clinton. That was amazing!!!! I love nature, so when I can I'll go for a hike in the beautiful mountains of Vancouver. I also paint and take art courses in between films. I practice yoga every day, cook and entertain lots of friends. Read and catch up with the latest movies and go to the theater at least once a month. My daily crossword puzzle. (The easy one!) I travel as often as I can. Every year I go somewhere new. One of my job's benefits is being able to travel the world while getting paid for it. In my business you always need to be updated with fashion, skincare and makeup, so it's a job in itself just to be in the know. This stuff is delish! And for $60 it's a steal! I even still like the original scent! An oldie but a goodie!